Why do modern fluorescent light bulbs take longer to brighten than incandescent bulbs? Incandescent light bulbs work by passing an electric current through a filament of metal and heating it within a few milliseconds to 2500 °C. This is very nice, but unfortunately around 98% of the energy used in doing this produces heat, not light! Compact fluorescent light bulbs are more complex. They pass an electric current through a gas which includes mercury atoms. The mercury emits ultraviolet light which is absorbed by chemicals on the inside of the glass tube. These chemicals ‘fluoresce’ giving out a mixture of colours that produce the sensation of white light. The amount of mercury in the bulb depends on temperature. Mercury is a liquid at room temperature and the mercury vapour comes from a tiny droplet of mercury in the bulb. At first, the amount of mercury is small and so not much ultraviolet light is emitted. 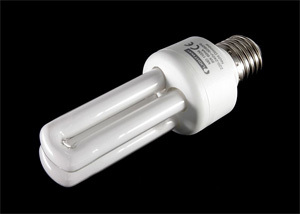 As the bulb warms up, more mercury evaporates and the intensity of ultraviolet light emitted increases – and hence the brightness of the fluorescent light.